Mayan jade plaque of unkown god. From "The Maya" by Michael D. Coe. From the now defunct Museum of Primitive Art in New York City. 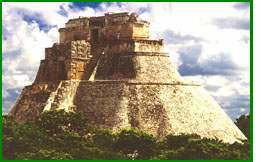 Pyramid of the Magician, Uxmal, Mexico. Could a changed climate be responsible for the fall of the mighty Maya? Some climatologists are convinced that some pre-Columbian (defined) civilizations rose and fell to the rhythms of climate change. Archeologists, too, think that climate is important, but its influence, they say, is usually but one of many factors that contribute to the ebb and flow of civilizations and culture. Indeed, climate may be one crucial key to understanding the fall of one of the most spectacular civilizations of the New World: the mighty Maya. Sometime around AD 800, the Classic Maya civilization experienced a rather sudden decline in parts of its jungle heartland. But just why this sophisticated civilization of jungle-shrouded cities and temples seemed to dissolve so suddenly has been a matter of speculation and learned disputation (defined) for some time. Speculation includes war, social chaos, unchecked population growth and disease. Recently, however, fresh evidence that the Classic Maya may have been felled, in part, by a changed climate has been drawn from sediment cores obtained from Lake Chichancanab on the Yucatan Peninsula. The sediment cores, taken by University of Florida scientist David A. Hodell and colleagues, indicate that a period of increased dryness set in about 800 AD. To a civilization facing lots of other pressures -- internecine conflict, unchecked population growth, environmental degradation -- the added burden of drought may have been enough to undermine the stability of the large Mayan cities situated in the lowlands of the Yucatan Peninsula, says Jeremy A. Sabloff, a Mayanist and the director of the University of Pennsylvania Museum of Archeology and Anthropology. "To a civilization facing a number of stresses both internal and external, the scarcity of water could have greatly increased the vulnerability of numerous Classic Maya cities," says Sabloff. The new evidence of a drier climate emerging at the time of the Maya civilization's sudden decline is just one link in the chain of evidence being accumulated by Mayanists, says Sabloff. "We're starting to get information that climate plays important roles in the development of culture. But the role of climate is still an open question," Sabloff told The Why Files. Climate, he says, had not gone unpondered: "It's a link that had been talked about before, but with Hodell's work it has a firmer empirical basis." That experimental footing is being extended to archeology as a whole. As climatologists and other scientists improve their methods for looking back in time, and as archeologists get better at ferreting out climatological clues in the detritus of ancient peoples, new links in the archeological chain of evidence of climate's influence will be forged. At coastal sites, looking for evidence of rising or falling sea levels, a phenomenon that would have lots of implications for cultural development. Some wooden artifacts such as the beams in a structure can yield climate information as scientists are able to extract information encoded in the growth rings of trees. Pollen and the remains of plants found in cultural context at a dig can yield clues to such things as rainfall and soil fertility. "We're trying to fit climate into the equation," says Sabloff. "To ignore it would be pure blindness." Many of us may be blind to what trees have to tell us about climate. But don't tell that to a dendrochronologist.